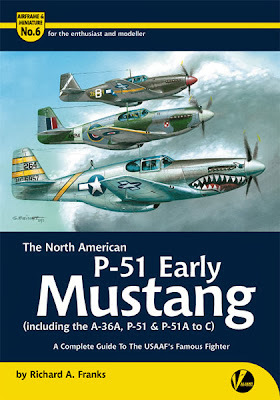 When I saw the news of this book come out – it was at the same time as Tamiya’s new 32nd scale F4U corsair unveiling – I thought it must have been an early Mustang – Valiant Wings have been so on the ball with their topical releases recently it must mean Tamiya was making a large scale early Mustang! Alas no – but we still have this book to get us primed for the time when our prayers come true and we see a really good kit of an early Mustang in 32nd scale. This book covers the early mustangs – Razor back canopies, Alison engines and Dive bombing A-36 Apaches with some Merlin engine Mustangs and Malcolm hoods thrown in for good measure. Physically this book resembles some of the earlier series of these books - through this book is benefited by yet more pages than it’s predecessors (each edition seems to have more packed in). This book is a glossy softcover A4 Portrait book with 192 shiny smooth pages and it is filled with period and black and white as well as shots of aircraft in the modern age and models of the kite in colour. Several sections of the book that deal with technical, variant and nomenclature, modelling, walk around and camo each have a large part of this book each – and well look at them each in turn now. Being the poor relation if you will to the much lauded “D” version of the Mustang I am sometimes a little cloudy on the origins of the genesis of the aircraft – it is in a forty-odd page first part of the book in which we look at the beginnings of this aircraft. From the English requirement to the North American firm’s boastful premise, to the early Alison engine and A-36 dive bomber requirement to the Merlin powered variants this part exposes the truths and some myths (the genesis of the “Malcolm hood” just one of them) about the early days of the mustang. Several pages of this first section show the evolution of the Mustang in all of it’s early forms. Each type and sub-type (sometimes one or just a few aircraft) has it’s own little section that shows how each variant changed physically, the camo and markings and specifications of each in a little breakout box. Several pictures show the aircraft in their glory and these often “funnies” will be quite interesting to modellers who are looking for something different as a subject. Whichever camouflage and markings that are not already covered are exposed in a twenty page sections which shows not only RAF and USAAF camo but also all of the users of the early Mustangs – including the Germans and Swiss. We get to know how these aircraft were acquired and what they were employed to do but mainly their colours and markings. Invasion stripes, the wear and tear of the colours and the paint sources are discussed as well as where specifically they were applied on each aircraft and the little differences. Again you will have to check your own aircraft’s research – and the Author even says that no absolute is perfect. But this is a very good resource for the first step of planning your kit. There are some handy illustrations of how some of the national markings of countries changed over time – and then one of the party pieces of this series.. The colour profiles by Richard J Caruana are indeed a great selling point in any book – and this title has seven pages – each with four aircraft on each page and supporting text in a caption to explain some of the characteristics of each kite. This is a generous selection of some very different schemes in all sorts of colours. There is lots of inspiration here. The next forty pages of this book are a boon for the early P-51 and A-36 Apache modeller. There are several reviews in twenty pages of 1/72, 1/48th and 1/32nd kits of both of these aircraft right up to the “D” model kits. Every kit I can recall is listed here in some very welcome brutal honesty. There aren't a heap of images so the text has to tell the story. I see some old “friends” here in this comprehensive list as well as the cause of some old modelling nightmares. The other part of this series I really enjoy seeing every time is the series of 3D isometric views of all variants of the aircraft, drawn by Jacek Jackiewicz these go from the experimental NA-73X right through major variants and single airframes to the dawn just before the “D” model came out. These show the isometric view of the Mustang and an arrow pointing to every little change brought to this type. In my view there isn’t a much better way to understand exactly how the early Mustang morphed than this series of just over twenty pages. Long may they include this part of the book. Another boon for modellers is the next section of walkaround and detail shots which include technical drawings of the aircraft from manuals and guides to the aircraft. Current restorations are carefully chosen to represent as close to the real thing in service as we can get which is really important to modellers. Another help to modellers is a full kit and aftermarket list of the early Mustang and A-36 variants. This is comprehensive and I found a few bits here I had no prior knowledge of. You cannot search it out on the internet if you don’t know about it! The last “page” of the book is a big one - a black and white set of fold-out 1/48th scale plans of the A-36, and P-51/1a and MK III(B/C) is here – showing all angles with lots of rivets on show! I really do not know the validity of any plan (in the world) of old aircraft but these drawn up by Jacek Jackiewicz look pretty good and will help a lot of people. Its just me as I have been bitten too many times by bad drawings to ever care for them very much, but to other modellers though this is gold! It is at the rear page as well so you could cut it out if you like to lay it out flat. The more I read this book the more I realize it’s a really neat way to separate the aircraft into two books – surely soon enough the later D and F-51 models will come in a further volume? Let’s hope for a full family of Valiant wings Mustangs in our future. The party pieces of these books make it an almost one stop shop for each aircraft they feature. Indeed if it want for our thirst for exploring the uncovered I would be happy to have just these books. Essential reading for early Mustang fans.